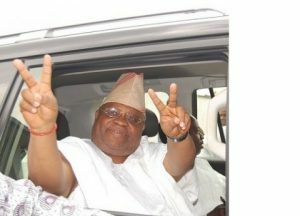 By Nuel Suji – The Economic and Financial Crimes Commission (EFCC) has denied freezing the bank account of Ademola Adeleke, the Peoples Democratic Party (PDP) governorship candidate in Osun. The anti-graft agency also said it did not place a freeze order on the accounts of members of his family, including popular musician, Davido. The PDP on Saturday alleged that the accounts of Adeleke family members had been frozen, describing it as “a recipe for crisis in Osun”. EFCC’ s spokesman, Wilson Uwujaren,, in a statement on Sunday, said the allegation is false. “The commission calls on members the public to disregard the report, which is patently false and contrived to dress the agency with a partisan garb in the unfolding political contest in Osun State,” NAN quoted him as saying.